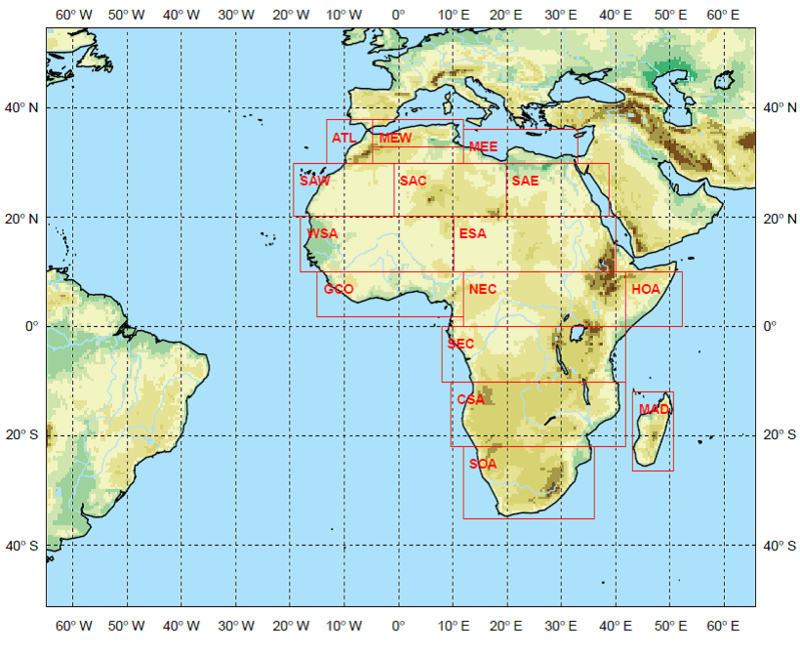 The aim of DEPARTURE is to assess the feasibility and the potential added value of regional decadal climate predictions for Northern Africa, including the tropical cyclogenesis, which is closely linked to the Africa Climate. DEPARTURE is a joint project of the research program MiKlip I. MiKlip I aims at the development of a model system that can provide reliable decadal predictions of climate and weather, including extreme weather events. By means of a multi-model ensemble with regional climate models (RCMs: REMO, CCLM, WRF) the decadal forecast skill of the West African monsoon and Atlantic hurricanes are assessed during a hindcast period and translated into an operational forecast system for the period 2015-2025. For the hindcast experiments we rely on decadal MPI-ESM-LR (ECHAM6/MPIOM) simulations for the 1960-2015 period. The hindcast simulations allow for a first assessment of forecast skill and uncertainty in the RCM multi-model ensemble. Based on global climate model predictions developed within the MiKlip framework, decadal forecasts are conducted as 10-ensemble runs from each RCM over the period 2015-2025 allowing a probabilistic forecast for quantification of uncertainties.Such a forecast is promising because boundary conditions such as anthropogenic land-cover changes (LCCs), greenhouse-gas (GHG) and aerosol (AER) emissions are crucial for West African climate and have high predictive skill at the decadal time scale, as they are mainly related to the rather stable process of demographic growth in sub-Saharan Africa. Furthermore, the forecast skill will increase considerably, if improved global SST predictions for the next decade will be achieved by other projects in the MiKlip consortium. Thus, DEPARTURE offers a promising test case for decadal SST forecasts as one of the overall MiKlip objectives and – at the same time – explores additional boundary conditions with decadal predictability such as LCCs and aerosols which are probably more relevant to African than to European climate. IMK-TRO contributes to the multi-model ensemble with the RCM COSMO-CLM (CCLM). 1. The investigation of the impact of aerosols on decadal predictability. For this purpose different aerosol climatologies in terms of different Aerosol Optical Depths (AOD) are used. 1. The investigation of the impact of SST boundary condition on decadal predictability. For this purpose, the SST provided by the forcing GCM is substituted by the SST from ERA-Interim re-analyses. 2. In order to investigate the impact of the soil-vegetation-atmosphere interaction as a lower boundary condition on decadal climate predictions, CCLM simulations coupled to different soil-vegetation models (SVATs) in different configurations are performed and analysed. Three different SVATs are used: TERRA-ML, which is the standard SVAT of CCLM, VEG3D, and the Community Land Model (CLM). The latter two will be online coupled to CCLM using the OASIS3-MCT coupler. In DEPARTURE, RCMs are forced by SST anomalies, radiative heating and LCCs in order to utilize the forecast potential from oceanic, atmospheric and land-surface boundary conditions. Dynamical downscaling is done with CCLM on the basis of SST-driven ECHAM6 simulations. A transient CCLM run for the period 1979-2010, driven by ERA-Interim analyses, was performed. Thus steady state soil conditions are achieved, which can be used as initial lower boundary conditions for the decadal hindcast simulations. Simulations are carried out using the CCLM model version COSMO_4.21_clm2. The model setup is identical to that of the CCLM CORDEX Africa simulation(Panitz et al., 2013). Thus, the horizontal resolution of the CCLM simulation is 0.44°. The model domain (Fig. 1) comprises the whole African continent. It has been chosen in such a way that the grid attributes of the DEPARTURE and CORDEX domains are identical for common regions. Compared to CORDEX the DEPARTURE domain has been extended to the west because one focus of DEPARTURE is on the development of tropical cyclones. Fig. 1: DEPARTURE model domain: 60.28°W – 60.28°E, 45.32°N – 45.32°S. Red boxes indicate African sub-regions for the analysis of results. The sensitivities of simulation results to variations to soil initial and SST boundary conditions as well as to the usage of different data representing the Aerosol Optical Depth (AOD) have been studied. The various simulation experiments are summarized in Table 1. Paxian, A., Sein, D., Panitz, H.-J., Warscher, M., Breil, M., Engel, Th., Tödter, J., Krause, A., Cabos Narvaez, W.D., Fink, A., Ahrens, B., Kunstmann, H., Jacob, D., Paeth, H. Bias reduction in decadal predictions of West African monsoon rainfall using regional climate models J. Geophys. Res., 121, 1715-1735 .